Christian Bale, who recently outed himself as a shy guy backstage at the Golden Globes, navigated the Screen Actors Guild Awards red carpet with reserve Sunday. In fact, the most animated gestures “The Fighter” actor put out were the raising of eyebrows or occasional nod of the head — until one fan in the bleachers got his attention. A man wearing a gray button-down shirt and black fedora shrieked Bale’s name, then ripped open his shirt to reveal a “Fighter” T-shirt underneath. The man thrust out a headshot — of Bale, we assume — at which point the amused actor finally cracked a smile and laughed. Bale then walked over to the bleachers and humored his fans, signing autographs for a minute or so before composing himself and continuing down the red carpet, toward the trophy he would later win for male actor in a supporting role. 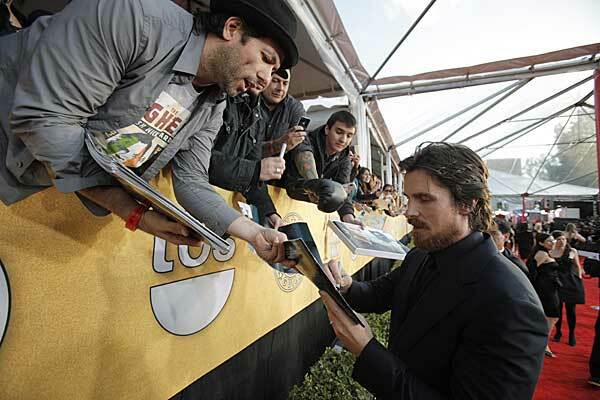 Christian Bale was nominated for The Fighter and was about to begin shooting on Christopher Nolan’s The Dark Knight Rises, the third and final installment of his Batman trilogy in which Bale starred as Batman/Bruce Wayne.